Well, today I have another Compagnie des Indes in front of me. 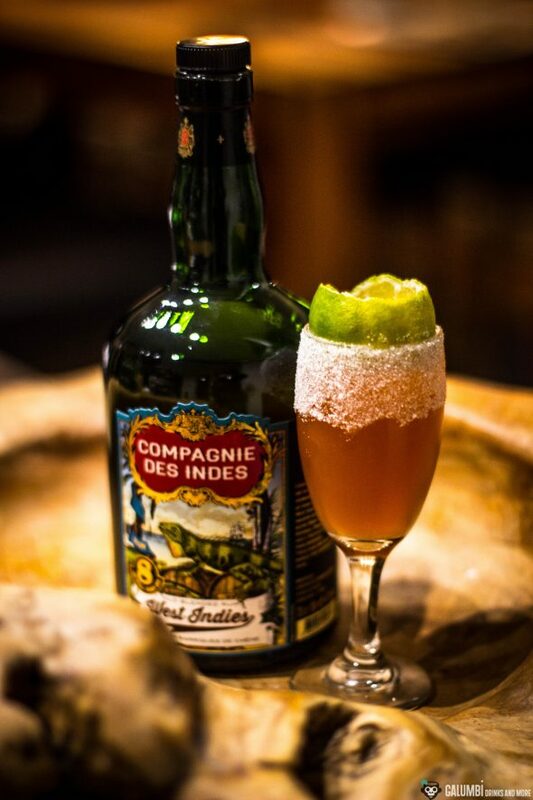 Strictly speaking, it is the Compagnie des Indes West Indies with an age of 8 years. With a price around 40 Euros, this bottle is rather located in the lower price segment and thus addresses beginners and cocktailians, but also “advanced” rum lovers. 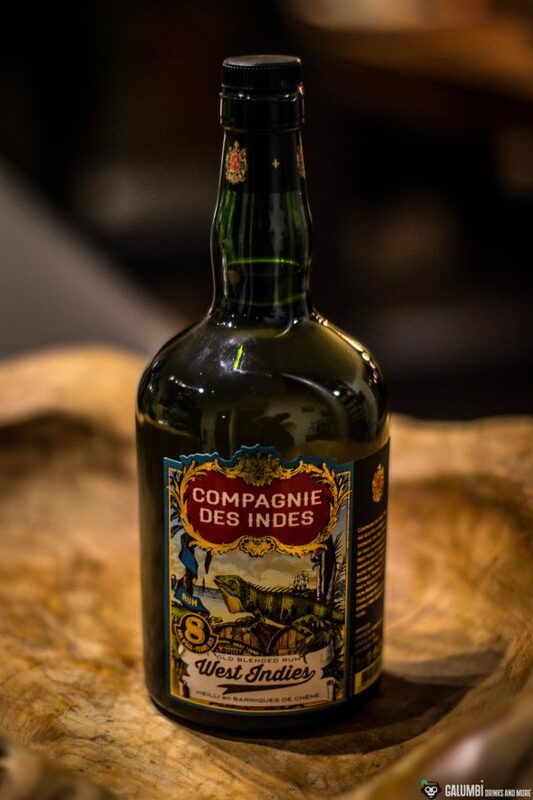 The name “West Indies” already reveals it: We are dealing with a blend of different molasses rum from several Caribbean states. These are Barbados, Guyana, Panama and the Dominican Republic. Friends of rum will of course know that not all of the states mentioned take the thing with the reliable age declaration all too seriously, so it is certainly good news that the bottler clearly states we’re dealing with a rum composed of “real” at least 8 year old distillates; no Solera maturation or things like that have happened here. Anyway, the rum was bottled at an ABV of 40%. Aroma: A quite nice, not too complicated and yet curious aroma profile rises from the glass. First, I find some fruit notes, such as peaches, bananas, rhubarb and oranges, in addition a beautiful and rich sweetness, whereby you can recognize typical Demerara notes from Guyana. Behind it, there is a quite interesting spice composition (cinnamon, maybe some sumac). Taste: A pleasant rum to drink with a nice, not exuberant sweetness. Honey, orange notes and again some peach combine pleasantly with spice notes (again I find cinnamon and sumac), in addition also some coconut blossom sugar. After some time, the barrels show their influence with slightly woody oak notes that strengthen the overall impression, but also bring some vanilla into play. Finish: vanilla, some oak and fruit, medium long. Of course, you can use such a rum – as already mentioned above – very nicely in cocktails. Today I opted for a drink that is quite a classic from the highly recommendable book “The Gentleman’s Companion, Volume II” by Charles H. Baker from 1939. Baker married a rich heiress and travelled the world with her. He wrote a book about their journeys in which he comes up with numerous anecdotes and recipes. In this book we find a cocktail called Martinique Crusta and also a Kingston Crusta, which apart from the used rum differs above all by the addition of ginger and/or Hellfire bitters (yes, the name Hellfire-Bitters appears in the book, though of course it does not refer to the Bittermens brand which did not exist back then). 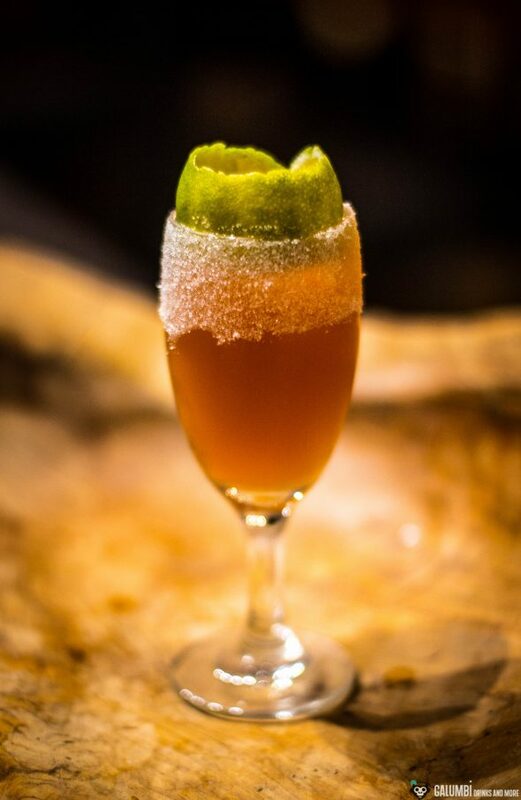 Since the Kingston Crusta can also be found in some later recipe collections with rum, which does not come from Jamaica (which is a little bit absurd considering the drink’s name), I wanted to take this into account when I simply called my variant “West Indies Crusta” – following the rum used. Essentially, however, the drink is clearly inspired by the Kingston Crusta. Preparation: First, peel a lime in one piece, if possible, so that you get a round and broadly cut strip of peel. Now moisten the upper third of your slightly pre-cooled glass with some lime and turn in a plate of white sugar in order to form a sugar coating. 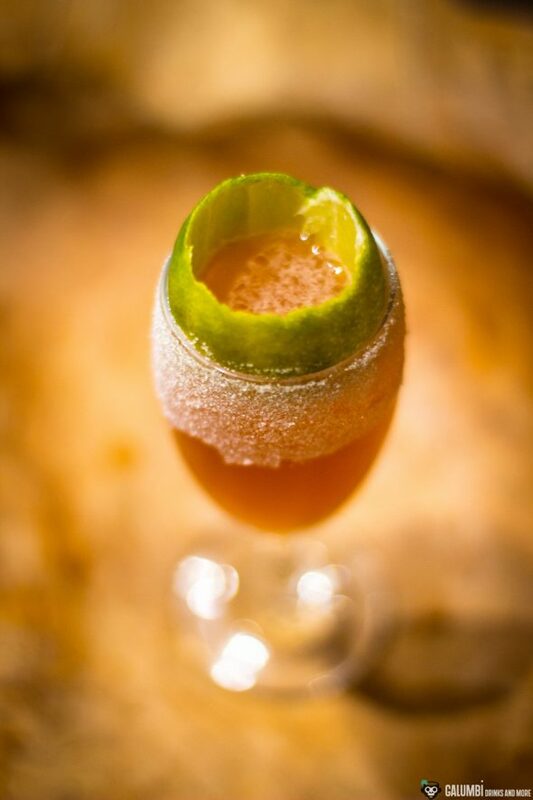 Now carefully place the lime peel into the glass so that it is stuck and does not fall onto the bottom of the glass, but protrudes at the top. 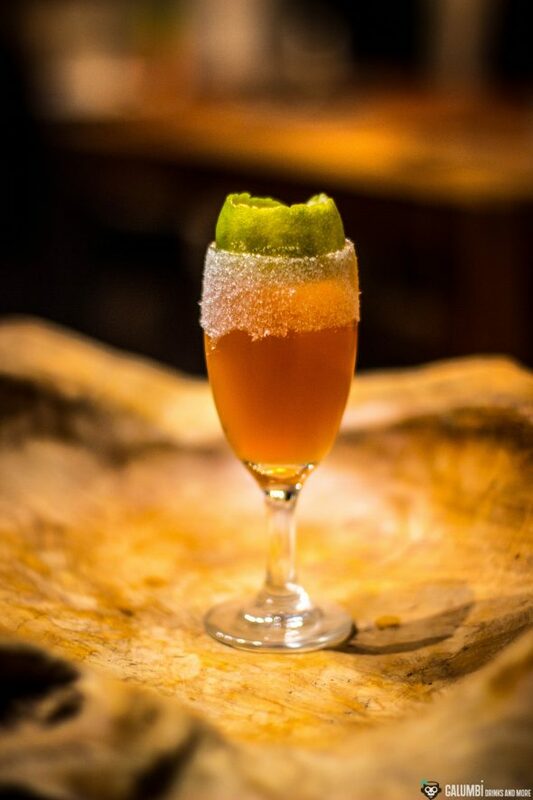 Then shake all ingredients vigorously on ice and strain carefully into the glass without damaging the sugar rim. In the course of his recipe of the classic Brandy Crusta, “Professor” Jerry Thomas recommended that one should smile at this step of the preparation. Therefore, it is best to follow his instructions!